Admit it. Some days you look in the mirror to see if you have a cape on your back. There isn’t one but you know that it could be there because you are a Super hero. You know, the person who can and does it ALL. The thing with Super Heroes, however, is that they are invincible. Us mere super women and men--are not. It often feels like we carry the world on our backs with all that we juggle in a given day, so what are we super people to do when we get sidelined with back pain? 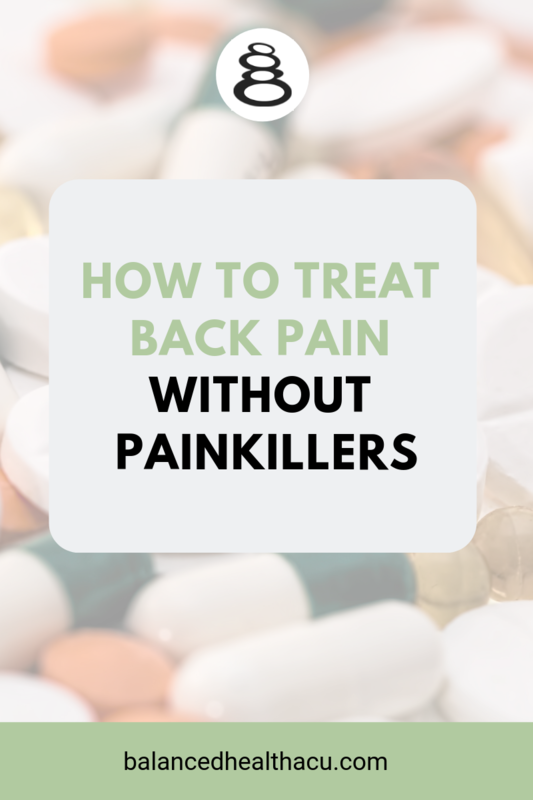 Too often the answer may be to just pop an over-the-counter painkiller and push through. Yet is that your best and only option? More than 2.5 billion dollars are spent on nonprescription painkillers each year, yet these meds are not without their risks and side effects, even for the infrequent user (source). Almost 80,000 people are admitted to a hospital each year for liver damage due to taking too much acetaminophen (source). Liver toxicity can occur when dosage exceeds 4,000 mg/day, which is 8 extra strength Tylenol (source). Non-steroidal anti-inflammatory drug (NSAID) use can lead to stomach upset and ulcers, kidney failure, elevated blood pressure and increased risk of miscarriage, stroke and heart attack. This year the FDA strengthened its warning of NSAID use stating that “heart attack and stroke risk increases even with short term use and risk may begin within a few weeks of starting an NSAID” (source). When you are in pain, of course you want to feel better and feel better fast, but choosing a method that leaves you vulnerable to other health problems is not worth the risk. Next time you are wondering how to treat back pain, instead of reaching for a painkiller, try these effective remedies. A safer alternative to painkillers to treat back pain are omega 3 essential fatty acids (EFAs). Omega 3 EFAs produce molecules necessary to reduce inflammation and promote healing. One study found that taking 1200mg/day of omega 3 EFAs produced the same pain reducing effect as an NSAID pain reliever (source). Our bodies do not make omega 3 EFAs so it’s essential to get them through food or a supplement. It’s best to choose an animal source of omega 3s as plant sources (such as flax, hemp or chia seeds) are low in EPA and DHA which produce the healing effects. Krill fish oil, compared to other fish oil supplements, is more potent, more bioavailable, less prone to oxidation, more sustainable as a source and is not contaminated with mercury or other heavy metals (source). Try this krill oil supplement instead of reaching for a painkiller to treat back pain. Ice has been a standard go to treatment method for injury, believing that it helps relieve pain, swelling and inflammation. Yet research has shown that ice actually delays healing by restricting blood flow to the site of injury. Even Dr. Gabe Markin, who coined the term RICE (Rest, Ice, Compression, Elevation) for treating injuries, is no longer supporting this recommendation (source). Heat, however is a quick and easy way to treat back pain. Heating sore muscles increases blood flow in the area of pain bringing with it healthy red and white blood cells to heal injured muscles as well as lymph cells to naturally reduce swelling. Simply place a heating pad on the area of pain for 20 minutes at a time for relief. Acupuncture is a great alternative to treat back pain that is effective, relaxing and pain free. Researchers have found acupuncture to be twice as effective for chronic low back pain compared to conventional therapy of drugs, physical therapy and exercise (source). Yet another study found that acupuncture reduced pain in acute low back pain patients faster and for a longer, sustained period than NSAID injections (source). Using very thin needles placed strategically on the body, acupuncture increases blood flow to injured areas, reduces inflammation and relaxes tight muscles. An acupuncturist may also use a technique called cupping to treat back pain. Cupping utilizes glass or plastic cups to draw up tight muscles to reduce tension and increase circulation. Massage is another treatment option that relaxes tight muscles, reduces inflammation and increases blood flow to treat back pain. Sometimes pain in our back actually stems from other areas of the body. An overly tight core, shortened hamstrings, or misaligned sacroiliac ligaments can all lead to undo stress or referred pain in the low back. Orthopedic massage therapists are trained to do assessment tests to determine the root cause of pain and areas of imbalance. Once the underlying culprit(s) are established, they manipulate soft tissue and muscle to reduce pain and restore structural balance. We live in a sedentary culture where the majority of our time is spent sitting at a desk, in a car or on a couch. According to Dr. Eric Goodman, founder of Foundation Training, excessive sitting has shifted how our muscles align and work. The large posterior chain of muscles (the multifidi, hamstrings and glute muscles) should take the load force of our movements. When they don’t fire correctly or are weak or unbalanced, the load force is instead felt in our low back. Based on a set of 15 exercises, starting with The Founder, Foundation Training is amazingly simple and easy to perform. According to Dr. Goodman, “Most people notice a difference in their body within a week or two. Within three weeks, you should notice profound differences, provided you’re doing the exercises five to 10 minutes every single day” (source). Emotional stress can also aggravate or even cause pain. Dr. John Sarno, author of the best-selling book, Healing Back Pain: The Mind-Body Connection, believes that pain is caused by repressed emotions and stress, not physical ailments. His prescription to treat back pain is to address any repressed anger and resume all normal physical activity (source). Journaling is a simple method for releasing pent up emotions and reflecting on any unfulfilled desires. Mindfulness exercises, guided visualization and even coloring have all shown to decrease stress and anxiety and can therefore also help to reduce back pain. I have incorporated each of these into my health routine because this super woman cannot be laid up with back pain. Next time back pain strikes you, try one of these treatment alternatives and skip the painkillers. How do you treat back pain? Share your tip in the comments below.